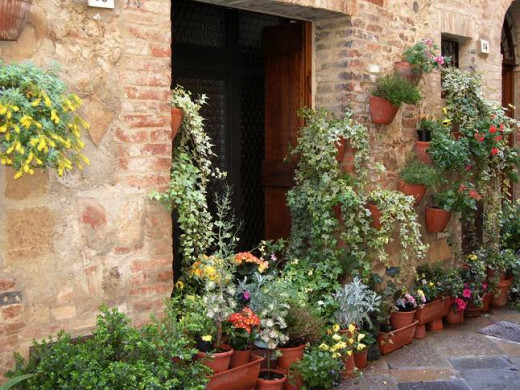 This is a continuation of our Villa in Tuscany vacation. 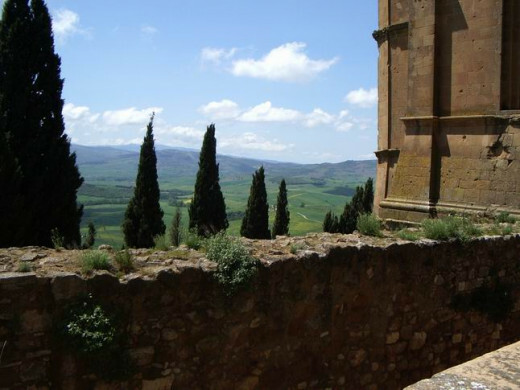 In Part 1 we relaxed and toured our closest town of Buonconvento as well as Montalcino. Part 2 saw us in Cortona, scene of "Under The Tuscan Sun" and Part 3 took us on a visit to La Lizza, the market at Siena to purchase that night's dinner - a beautifully fresh Salmon. Today we are visiting Pienza, our (my husband's and my) favourite little town on this trip. Pienza - it almost sounds musical to me, as though it shoud be an opera. It is instead a beautiful little hill town, yet another commune in the Val d'Orcia in Tuscany - lying in between the towns of Montepulciano and Montalcino. We visited Montalcino our first day out in this week, having a lovely little Tuscan lunch while there. In 1996 Unesco declared the town of Pienza a World Heritage Site and in 2004 the entire Val d"Orcia was included on the list of World Cultural Landscapes. This is in fact where the monastery scene in the movie "The English Patient" was set. Another important fact is that this place, originally called Corsignano, was the birthplace in 1405 of Enea Silvio Piccolomini - better known as Pope Pius 11. It was after he became Pope that he had the entire village rebuilt as an "ideal Renaissance" town, intending it to be a retreat from Rome. 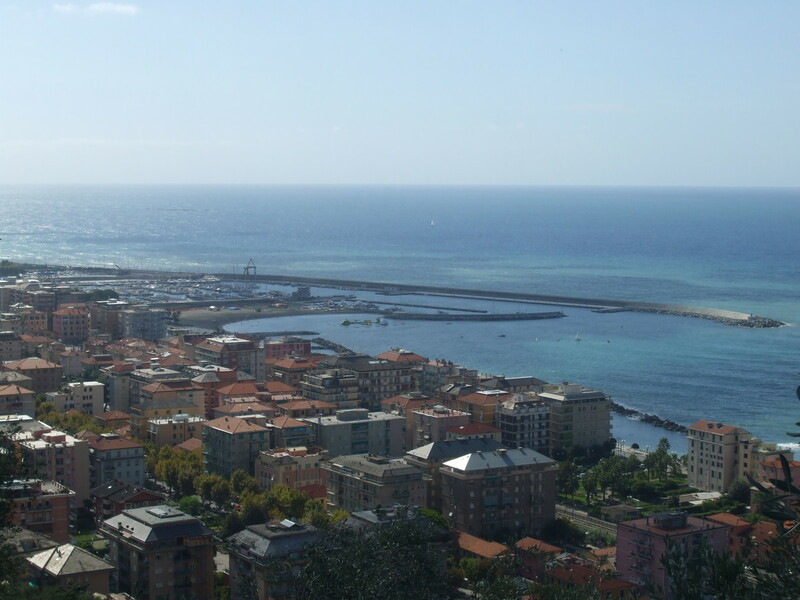 It ended up being a model for other urban planning concepts elsewhere in Italy and eventually on into other European centers. 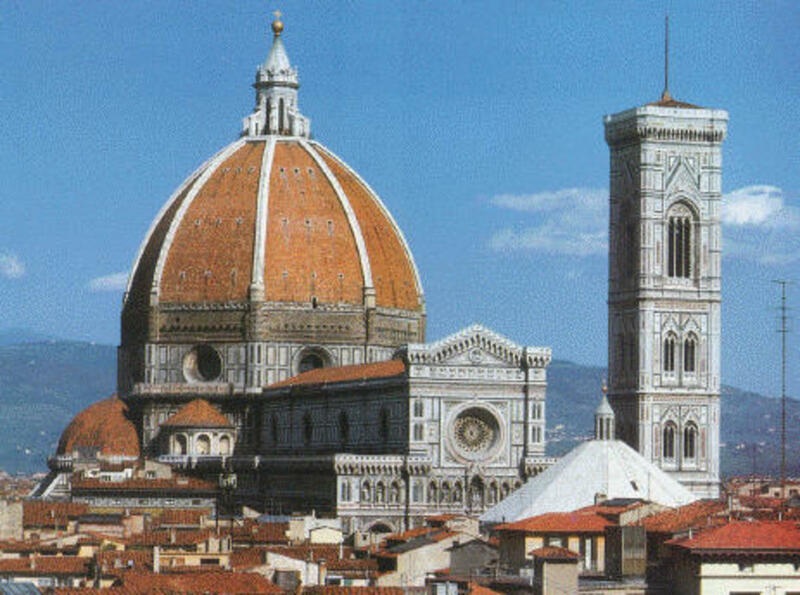 Throughout the town there are many beautiful examples of Florentine architecture, but what took my breath away was the "prettyness" (if there is such a word) of the town itself. From its quaint cobblestone streets, to its many doorways leading to the outer wall, to the glorious displays of potted plants and lush vines, there was much to look at and admire. 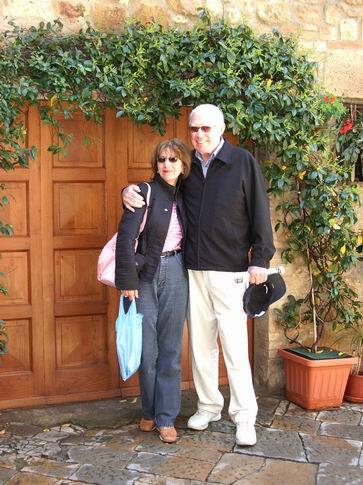 Not too far into the town, Craig and I stopped to have our picture taken in front of one of the beautiful wooden doors that Tuscany is so well known for. Under our feet was an immaculately clean flagstone entryway. 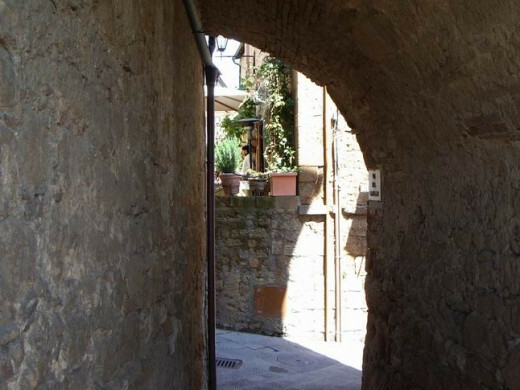 As the six of us walked along we passed an entranceway to a very quaint looking alleyway. At the far end was an open archway, beckoning us to approach and enjoy the view of the rolling hills beyond. Coming out at the other side we were met with a walkway fringed by a short ledge, winding around the outside wall. 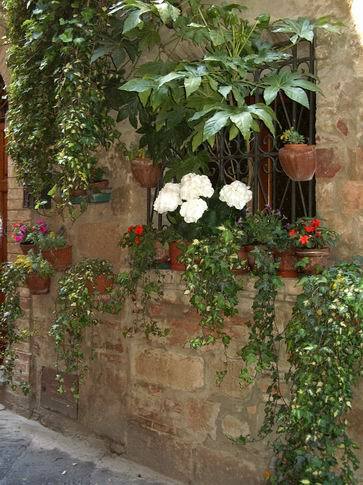 Here and there were doorways, once again adorned with potted plants and greenery. And beyond the ledge were the gently rolling green hillsides of the Val d'Orcia. We strolled around the outer wall for a bit, stopping to sit on the ledge and just gaze out to the beautiful scene before us, eventually entering back in through one of the many little doorways to the inner town. It seemed like there were secret places everywhere and it was so enchanting. With lunchtime not far away we kept our eyes open for a nice place to eat, pondering an outside cafe. But there was just a bit of a chill in the air that day, so we ended up at the doorway of another restaurant that, once again, beckoned us because of its "prettyness". Trattoria Bar La Buca delle Fate, looked to have a very interesting menu, so it didn't take long to convince us to give it a try. We were all by this time ready for a glass of wine or two also. Sandy and Joe decided to try Cognilio Arrosto - Roasted Rabbit, which was one of their specialities, while the rest of us chose different pastas and salads. Even being Italian, I don't think I was ready to eat what I thought of as a little bunny, although judging by Sandy and Joe's appreciation, I am sure it was quite delicious. As we were relaxing with our glasses of wine we started to hear a little whining sound, now and again. Then all of a sudden we realized a couple in the corner had a little dog, that I am sure they were trying to keep out of sight. Of course he was having none of that with food on the table. I've heard of people in Paris taking their dogs to outside cafes, but never before had we seen a dog in a restaurant in Italy. I'm sure they were well known by the owners, and after all he was very well behaved so we just ignored him. Feeling quite satisfied with our lunch in general and getting a second wind after a relaxing hour or so, we decided to head out to the streets again and check out more of the town. We were in no hurry and could think of no better place to be today. 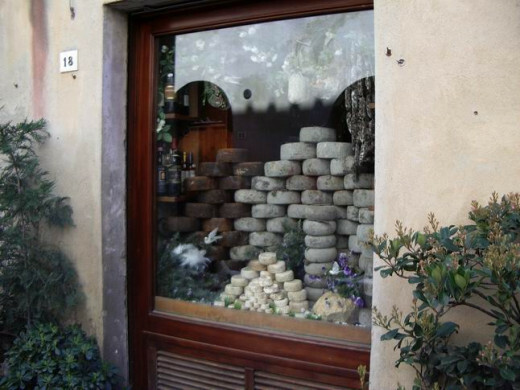 Soon we were drawn to a display window with rounds of cheese piled high in a pyramid fashion and found that this is the Pecorino Cheese that Pienza is well known for. 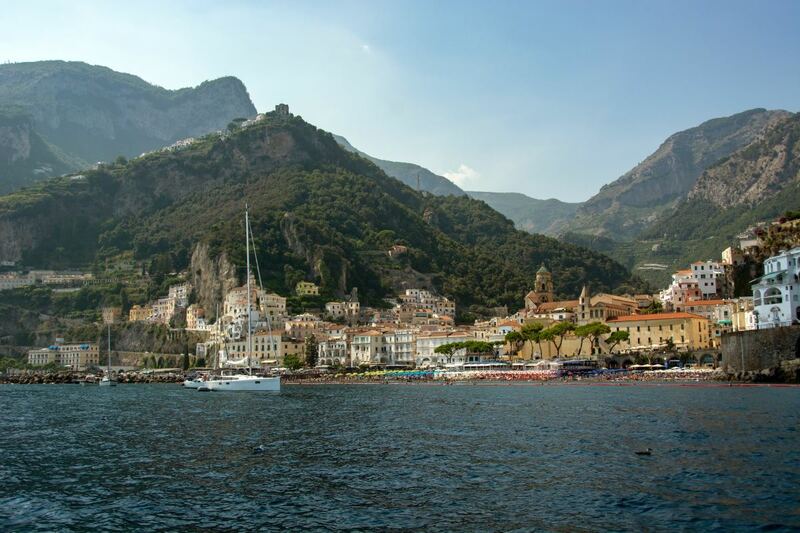 In fact it is considered one of Italy's best, especially the version "sotto cenere" or "under ashes". The cheese has ancient origins and has probably been produced in this area since man first settled there. Sometimes known as "Pecorinio della Val d'Orcia" or "Cacio di Pienza" it is produced between October and July and seasoned for up to two months to give it its distinctive flavour. Having entered into this shop we could certainly attest to its strong aroma. Wandering along we see a little Enoteca, with shelves on its outside stone walls holding bottles of wine as well as olive oil and various other delectable looking products. 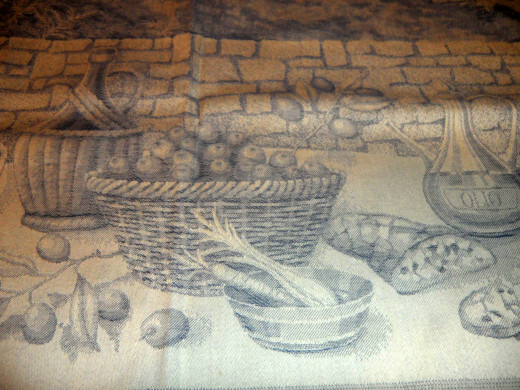 In another store I am inspired to pick up little packages of herbs and pesto mixes as well as pretty linen tea towels, tastefully printed with muted scenes of Pienza - for my mom and two aunts. Sadly its time to go, but before leaving we wander outside the walls again to the outer ledge and we take a few more photos of the surrounding scenery. I know both Craig and I are thinking "one day we will come back". Unfortunately we will not be able to make that trip together again, but who knows, maybe one day I will find myself there again. I can't explain what it was really, but I loved Pienza. Before we head back to Casa Rasa we have one more stop to make - Montepulciano. 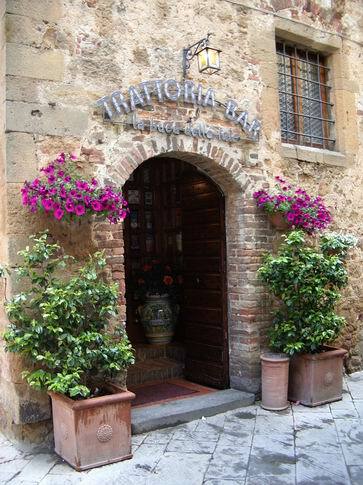 We had decided to check this out too because of its close proximity to Pienza. But I am a little embarassed to say that when we got there Craig and I seemed to have no interest whatsoever to trek up the long climb to the center of town. Maybe we pooped ourselves out in Pienza, I don't know, or maybe we just wanted "to remember Pienza". In any event we decided to sit at the entryway and have a latte, telling our friends "let us know what you saw when you return" and off they went. Of course Montepulciano is yet another medieval and Renaissance hill town in the Province of Siena. It is a major producer of food and drink with wine connoisseurs considering its Vino Nobile among the best in Italy. Besides that it is also known for its pork, cheese, "pici" - which is a thicker chewier variant of spaghetti, lentils and honey, but still we sit and sip our latte, and watch the people stroll by. We are thinking "maybe we should have come here first and done Pienza second". 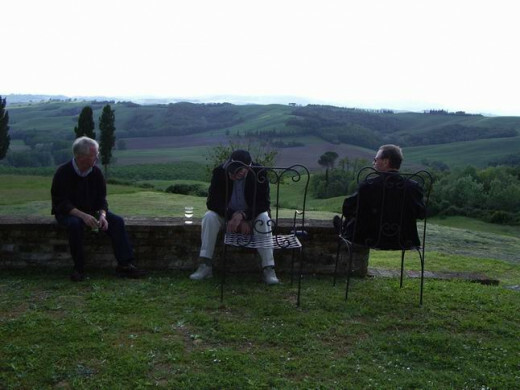 But still we remember that late afternoon, sitting and relaxing in Montepulciano. In truth it was not too long before we saw the foursome coming back down the sloped road to join us for a drink, exclaiming that there really was not much to see - at least as far as they ventured. I suspect that all of us were just a bit too tired and that had more to do with it than anything. Back at Casa Rasa we looked forward to chilling out for a couple of hours before dinnertime. The three guys head out to sit on the iron furniture at the edge of the property with the "view". They are chatting away at whatever it is that men chat about, or I suspect they can just sit in silence, as men seem to be able to do. We three ladies of course are chattering away up on the loggia, going over what we have seen today and wondering what we will wear for dinner tonight. Before long we find ourselves back in Buonconvento, our closest town to our villa as we had made reservations for tonight's dinner yesterday when we four Canadians were there for lunch. Up to the second floor we go once again, but this time we are sat by the big window looking out and down to the street velow. On the table of course is the normal bottle of Vino Rosso, which we will keep tonight along with the request for a second bottle of Vino Bianco. And if I wondered if we would be regaled with the variety on the "menu" in the same fashion as the day before, I was not to be disappointed. Soon the same little lady that we had at lunchtime yesterday, reappears with the wine, as well as the little requisite slip of paper in her hand - her menu - and she begins reciting to us: Prima Piatti - Pasta: Penne, Fettucini, Spaghetti, etc. Salsa: Pomodore, Arrabiata, Bolognese etc. Secondo Piatti: Cognilio, Vitello etc etc. And we all smile, as we make a toast to each other, to the lady of the restaurant and to Tuscany itself. Salute!! Tomorrow will be our last full day in this villa, before we four Canadians head off to San Gimignano for a two day stay. Please check back to hear about the Abbey of Monte Oliveto Maggiore. Thank you once again whonu - for stopping and reading!! This is beautiful in words and pictures, craiglyn. Thank you for sharing this lovely bit of history and precious memories.